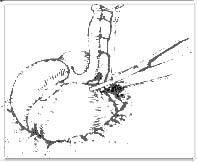 Appendicectomy may be performed laparoscopically or as an open operation. Laparoscopy is often used if the diagnosis is in doubt, or if it is desirable to hide the scars in the umbilicus or in the pubic hair line. An appendicectomy (or appendectomy) is the surgical removal of the vermiform appendix. This procedure is normally performed as an emergency procedure, when the patient is suffering from acute appendicitis. In the absence of surgical facilities, intravenous antibiotics are used to delay or avoid the onset of sepsis; it is now recognised that many cases will resolve when treated non-operatively. In some cases the appendicitis resolves completely; more often, an inflammatory mass forms around the appendix. This is a relative contraindication to surgery. Recovery may be a little quicker with laparoscopic surgery; the procedure is more expensive and resource-intensive than open surgery and generally takes a little longer, with the (low in most patients) additional risks associated with pneumoperitoneum (inflating the abdomen with gas). Advanced pelvic sepsis occasionally requires a lower midline laparotomy. In general terms, the procedure for an open appendicectomy is as follows. Antibiotics are given immediately if there are signs of sepsis, otherwise a single dose of prophylactic intravenous antibiotics is given immediately prior to surgery. General anaesthesia is induced, with endotracheal intubation and full muscle relaxation, and the patient is positioned supine.The abdomen is prepared and draped and is examined under anaesthesia. If a mass is present, the incision is made over the mass; otherwise, the incision is made over McBurney’s point, one third of the way from the anterior superior iliac spine (ASIS) and the umbilicus; this represents the position of the base of the appendix (the position of the tip is variable). An inflamed appendix can be life-threatening, particularly if the patient is out of reach of medical care. Historical records show a number of appendectomies carried out by unskilled ad hoc surgeons, communicating with a base hospital by telephone or even telegraph. To find the cause of unexplained abdominal pain, exploratory surgery is sometimes performed. If the cause of symptoms does not lie in the appendix, the surgeon will thoroughly check the other abdominal organs and remove the appendix anyway, to prevent problems in the future. Recent findings on the possible usefulness of the appendix has led to an abatement of this practice. If appendicitis develops during pregnancy, an appendectomy is usually performed and should not harm the fetus.